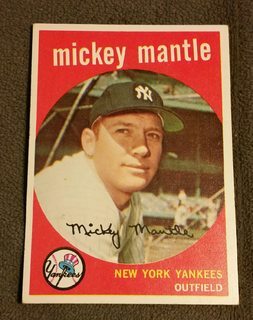 The official Mickey Mantle Pickup Thread. All Mick, all the time! Me too especially with items I like. The K or no K green both seem to be fairly common after a quick eBay search. I sorted my PSA set by completion percentage and I rise from 29th to 13th, with 19 more Mantles (15 new) in the queue in Newport Beach. So I'm very close to hitting 50% of the Master Set Registry, even with those new oversized cards being added. Picked up 3 Holiday Inn coasters. Now I have 3. Ben, I think you picked up the large one recently also but I couldn't find the thread where you showed it. I think you said it was an uncatalogued version. Hopefully someone isn't currently churning them out. The Jay Publishings all got hammered for some reason. Exhibits were okay as compared to what I expected. The Challenge the Yankees card was evaluated by COMC as NM and while it had a little corner wear, got a below expected VG-EX. I think I have posted all these in the thread before, but if you want to see something specific, I can probably dredge up the before scan. Last edited by swarmee; 04-12-2019 at 04:28 PM. Fresh back from PSA today. Not sure how the AS garnered a straight 6. Nice Mike! The brown batting right and mileage charts are beautiful. I don't have the large coaster you show, but I have seen it before. I honestly just thought it was a fantasy piece since the only fake (that i am aware of) from the hotel is a paper placemat that has the similar color scheme and it isn't catalogued anywhere. The placemat is easy to tell it is a fake though since the paper isn't actually textured it is just a scan. What does the the back of the coaster look like? You are probably the best judge if it is a legit item since you have it in hand. Chris, do you have one? I have a fake placemat but no coaster. Was disappointed that the placemat wasn’t real though. Ben, the coaster is textured. I've attached a couple of closeups (darkened a little to help show the texture). It doesn't feel like the brown one in that the brown one feels more like linen than paper and this feels more like paper. Raymond, that is a gorgeous '59. Well, the front is anyway - back is dirty and I paid too much. Picked up a nice '59 for my display piece I'm working on. Actually cracked this one out of a slab, and I'm very happy with the eye-appeal. It will fit seamlessly into my display I'm slowly working on. The brightness along the bottom right corner is from the light source when I was taking the picture. I bought a Mantle & I don't regret it.